Duke Energy can't rule out that ash might be escaping and flowing into the river. 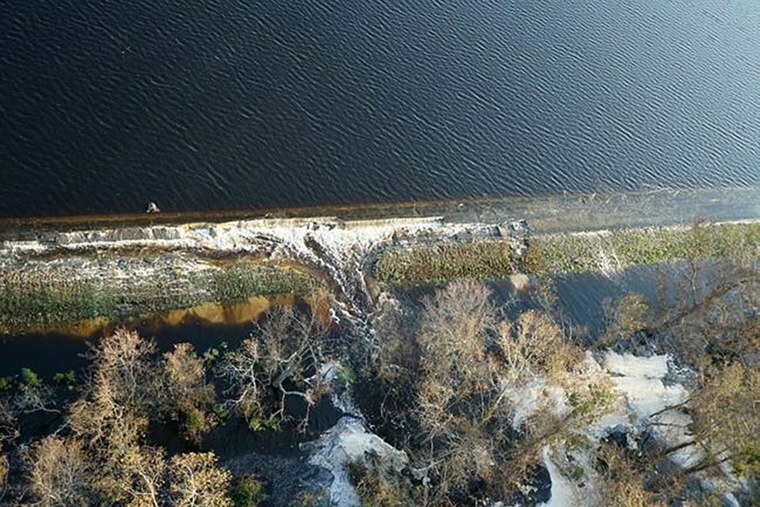 Duke Energy said Friday that a dam containing a large lake at Wilmington, North Carolina, power plant has been breached by floodwaters from Florence, and it's possible coal ash from an adjacent dump is flowing into the Cape Fear River. Duke spokeswoman Paige Sheehan said Friday that floodwaters continue to overtop an earthen dike at the north side of Sutton Lake, a 1,100-acre reservoir at the L.V. Sutton Power Station. That water has caused several breaches in the dam on the south end of the lake, which is flowing back into the river. The company said that because of the high water levels in the river from the hurricane, they do not expect water levels to be affected by the breaches in the dam. Sheehan said floodwaters also had overtopped a steel retaining wall containing one of three large coal ash dumps lining the lakeshore. Sheehan described the incident as a "developing situation" and said the company can't rule out that ash might be escaping and flowing into the river. Gray material that the company characterized as lightweight coal combustion byproducts could be seen Friday floating on the top of the lake. The ash left over when coal is burned to generate electricity contains an array of components, including mercury, lead, arsenic and other toxic heavy metals. The inundated basin contains at the plant 400,000 cubic yards of ash. The current incident is separate from the rupture at a nearby coal ash landfill reported at the site last weekend, spilling enough material to fill 180 dump trucks. The site received more than 30 inches of rain from former Hurricane Florence, with the Cape Fear River expected to crest Saturday. Duke's ash waste management has faced intense scrutiny since a drainage pipe collapsed under a waste pit at an old plant in Eden in 2014, triggering a massive spill that coated 70 miles of the Dan River in gray sludge. As of Friday afternoon power outages across North Carolina after Florence had dropped to around 47,000, according to the state Department of Public Safety. Duke Energy said Friday in a statement that 26,000 of its customers remained without power, and that power had been restored to 1.8 million customers in North and South Carolina. The company said that it expects to restore power to 99 percent of customers by Sunday night, but some outages in North Carolina, like in Jacksonville, Morehead and New Bern could linger into Monday.